Although she was born and raised in Sydney, Justine Schofield is half French, her heritage playing a major role in her culinary prowess; fluent in the native language, and flawless in her cooking style. With her hectic schedule of filming, cooking and travelling across the country, it's a wonder the 26 year old chef has time to taste her creations - describing food as being the "greatest form of comfort". 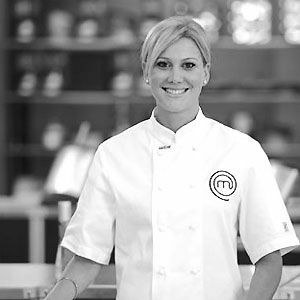 Impressing MasterChef Australia judges with her penchant for calm and organised cooking, Justine wooed hearts in the first ever television series, airing in 2009. Making it through to the top 20, Justine's fresh faced approach to cooking took her from strength to strength, cooking for Jacques Reymond and cooking off against Matt Moran. After her stint on the series, Justine established her own business 'Justine Schofield Catering', where food became work, art and passion combined, travelling around Australia to cater for private functions. Additionally, her screen presence expanded to hosting her own television series 'Everyday Gourmet with Justine Schofield', hitting the screens in April 2011. A big believer in quality ingredients, an appetite for adventure and sharing the culinary creations with family and friends, Justine's sassy, down to earth nature and infectious passion for food has her fan club ever expanding.